THE HOTEL CAPTAIN COOK AND CAPTAIN COOK ATHLETIC CLUB Reciprocal Club: The Hotel Captain Cook and Captain Cook Athletic Club By Michelle Van Slack, Director Member Services The last frontier A Michelle Van Slack is Director Member Services. 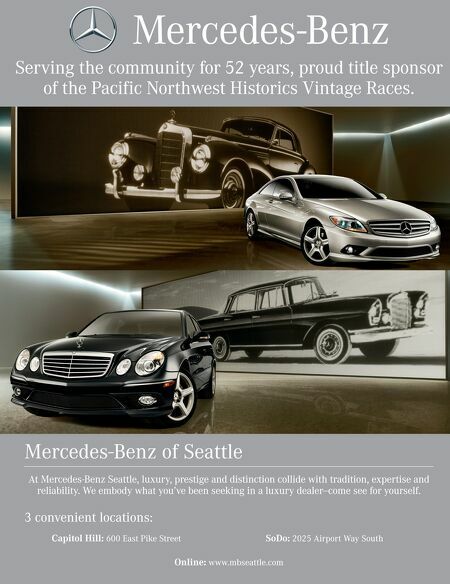 Send her feedback on your reciprocal club visits at mvanslack@wac.net 939 W. 5th Ave. Anchorage, AK 99501 P: 907.276.6000 captaincook.com ACCOMMODATIONS » 547 rooms, including 96 suites Leave the Lower 48 behind and meet the well-appointed wild North laska, there is simply no other place like it. If you are looking to revel in nearly endless (but never hot) sunshine, marvel at spectacular mountain vistas, and experience the occa- sional moose walking down the road, then I recommend you visit Anchorage, Alaska. I spent a summer working on a bi-level domed passenger train based in Anchorage. I got to explore a fair amount of Alaska that summer, and I would highly recommend a visit. Whether business or pleasure takes you to Anchorage, you would be wise to stay at our reciprocal sister to the north, The Hotel Captain Cook and Captain Cook Athletic Club. Although much of Alaska is still considered the last frontier, The Captain Cook will surround you with luxury. Known for its high standards of service, the hotel has 547 rooms, including 96 suites, located in three towers with sweeping vistas of Cook Inlet and the striking Chugach Mountains. 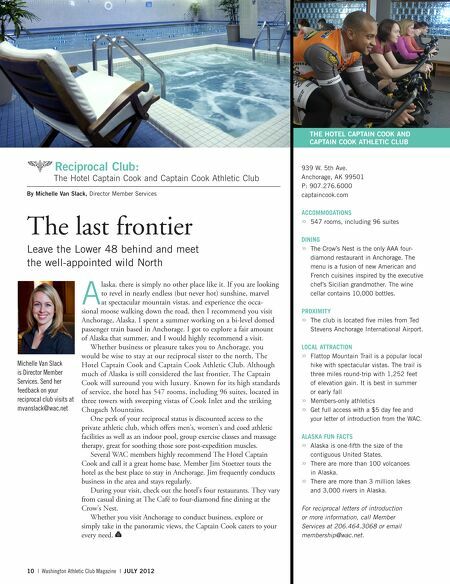 One perk of your reciprocal status is discounted access to the private athletic club, which offers men's, women's and coed athletic facilities as well as an indoor pool, group exercise classes and massage therapy, great for soothing those sore post-expedition muscles. Several WAC members highly recommend The Hotel Captain Cook and call it a great home base. Member Jim Stoetzer touts the hotel as the best place to stay in Anchorage. Jim frequently conducts business in the area and stays regularly. During your visit, check out the hotel's four restaurants. They vary from casual dining at The Café to four-diamond fine dining at the Crow's Nest. Whether you visit Anchorage to conduct business, explore or simply take in the panoramic views, the Captain Cook caters to your every need. 10 | Washington Athletic Club Magazine | JULY 2012 DINING » The Crow's Nest is the only AAA four- diamond restaurant in Anchorage. The menu is a fusion of new American and French cuisines inspired by the executive chef's Sicilian grandmother. The wine cellar contains 10,000 bottles. PROXIMITY » The club is located five miles from Ted Stevens Anchorage International Airport. LOCAL ATTRACTION » Flattop Mountain Trail is a popular local hike with spectacular vistas. The trail is three miles round-trip with 1,252 feet of elevation gain. It is best in summer or early fall » Members-only athletics » Get full access with a $5 day fee and your letter of introduction from the WAC. ALASKA FUN FACTS » Alaska is one-fifth the size of the contiguous United States. » There are more than 100 volcanoes in Alaska. » There are more than 3 million lakes and 3,000 rivers in Alaska. For reciprocal letters of introduction or more information, call Member Services at 206.464.3068 or email membership@wac.net.